Jujube fruit is one of the important items in Chinese traditional medicine. 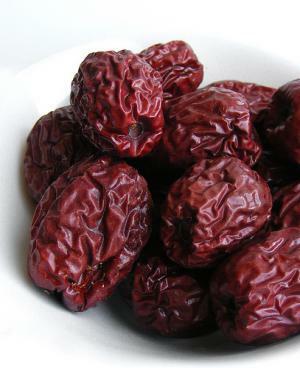 This fruit, which comes from the Ziziphus zizyphus plant, is also called jujuba, red date or Chinese date. It is a small deciduous tree with shiny oval leaves and yellowish-green flowers. The fruits are first green in color and as they mature they turn purple or dark red. Jujube fruit tastes something like apple, and as it matures the skin starts wrinkling, making it look like regular dates. Jujube fruit is cultivated in Southeast Asia but today the tree, which is very resistant, is cultivated all around the world. it has been used in traditional Chinese medicine for over 4000 years and it was first introduced to America in early 19th century. Jujube fruit can be consumed raw, but its benefits increase if it is processed through boiling, baking, stewing or drying. As for the nutritional content, jujube fruit is packed with vitamins and minerals. It contains 20 times more vitamin C than any citrus fruit, which is amazing, since citrus fruits are known for their high content of this important vitamin. It is also rich in vitamins of the B complex, like vitamin B1, B2 and B6. As for the minerals, jujube fruit contains manganese, potassium, iron, calcium and phosphorus. In addition to all these vitamins and minerals, jujube contains 18 out of 24 important amino acids. Regular consumption of jujube fruit benefits the maintenance and proper functioning of the blood stream, bones, joints, skin, hair, muscles, hormones, enzymes and neurotransmitters. This fruit promotes healing of damaged cells and tissues and boosts the immune system. It eliminates free radicals from the liver, purifies it and prevents liver problems. There is even evidence that jujube fruit prevents the development of cancerous cells that lead to leukemia. In addition, this fruit reduces the toxicity of certain drugs, treats anemia, purpura, skin disorders, fatigue, hysteria, lack of appetite and loss of energy. It can also be used as a mild sedative. Jujuba fruit can be consumed fresh, cooked or dried, and it also comes in form of capsules, which are available in health food stores and alternative medicine shops. The ideal daily intake of the jujube extract is 10 to 30 grams per day, although there is no evidence that over-consumption of the extract or the actual fruit has any side effects. However, persons who suffer from bloating, excessive phlegm and parasites should consult a physician before taking the extract.